How to assess what damage you already have, so that you’ll know what needs fixing and perhaps how to prevent any future problems. To get the best out of this guide then start getting at least vaguely familiar with bike part jargon. Check out the video on our Bicycle Anatomy for Beginners page to swot up on some basic part names. Next time you take your bike for a spin, take out your earphones, hat, muffs or whatever is your ear stuffing thing of choice and listen carefully. Q – Do you hear anything? YES – If you hear any rubbing, clicking, popping, creaking or clunking then pop over to http://www.sheldonbrown.com/creaks.html to try find a solution. WARNING – It may save you a hairy accident so pay heed to your bicycles sounds of warning. Q – Are there any large, small or even tiny cracks? YES – Don’t ride it and get it looked at by a mechanic. They should do it for free and it’s better to be safe than sorry. TIP: Cracks can usually be found near any joints. Tyres: Check out the surface and side walls of your tyre. YES – Cracks shouldn’t be much of a problem unless you can see the fabric underneath but if you see any glass imbedded then try to pick it out with tweezers, otherwise it will eventually worm it’s way to your tube. TIP – The back is usually worse affected by wear than the front. You shouldn’t need to replace a worn tyre unless punctures become frequent. WARNING – Don’t be tempted to swap a back tyre with the front. The front is most important for safety as a blowout on the back is easier to control than the front. Brake Pads: Unhook your brakes from the cable or take off your wheel. Q – Can you still see the wear line or ‘groove’ on the braking surface? NO – If there is no wear line and they look quite thin, then it’s time to replace them. YES – Good. They should be fine but check again in a month, especially the front brakes in Wellington. WARNING – If they are worn with a slope or one edge has a lip or is un-warn then the pads are not in-line with the wheel rims but it’s best to continue until they don’t brake as well or squeak. Q -Do any teeth look badly worn (very sharp, look like shark fins, snapped or very short)? YES – This may lead to the chain slipping under pressure and they will need replacing when it does. TIP – Making sure the chain is as clean as possible and replacing it when it’s warn will extend the life of your ‘teeth’ which are much more expensive to replace. WARNING – If you replace a ring or more then you will need to replace the chain too. If you use a new chain on badly warn rings then the chain will slip. 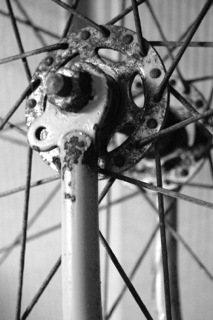 YES – Old wheels rust or become rough (think about getting a new wheel), they could even split or bulge at the seam (you could replace or fix – ask a mechanic) and most rims get black with dirt and brake pad residue (just clean once a week). TIP – There may be a wear line or groove running in the center or the rim. Rust is not your friend but it’s hard to fight. Keeping your bike oiled once a week or two and keeping it indoors or in a garage will help win the war. The chain – Check and clean once a week or two. Seat tube – Make sure to loosen the clamp and take it out once every 6 months or so as it could get stuck. Once out, wipe it clean and re-grease it. 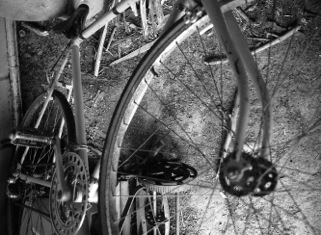 Cables – Spray with WD40 once a week anywhere they enter the frame or cover. If one is already rusty, then replace it and bask in the difference a new one makes to braking and gear changes. Nuts & Bolts – Try keep them dry as best as you can. Any that are stuck can be unstuck using WD40 and letting it soak for a minute. If one is badly warn or tough to turn then replace it as you don’t want to get to the point where you can’t remove it at all. TIP – Rust can often be rubbed off by spraying it with WD40/CRC and then rubbing it with a pan scourer/sponge. 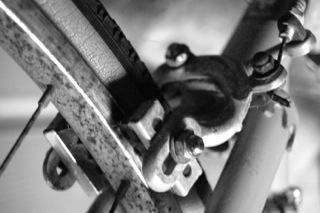 Cogs: Check the small cogs on the derailleur/derailer (back gear arm) for dirt. They can often get thick with it. If so use a flat screwdriver to scrape it off. Cassette and Cranks (back & front wheel rings and pedals): Spray with degreaser, let soak, spray with water. Scrape inbetween the cassette rings if dirty. Chain: Spray with degreaser, let soak, spray with water. The most important part to clean is inbetween the links, not the surface. After a good service or before an important ride there are things you should check out to make sure you’ll be safe and trouble free. Inflate Tyres: Keep your tyres good and hard. If not it will be harder and slower to cycle. But of course be careful not to over inflate. It’s hard but possible especially if you risk using service station pumps. Wheels: Check for side to side wobble, spoke tension and wheel buckle. If you can wobble the wheel then it’s either too loose or there’s some damage to the hub. If a spoke is loose then it will sound flat or dull and should be tightened soon. If a spoke is broken then you should replace it but it’s not the end of the world. If the rim of the wheel spins parallel to the brake pads but then suddenly moves towards them with a jerk then your wheel is buckled. It can be fixed but if you don’t know how, it’s better to get a mechanic or skilled friend to do it. Tighten up: Go round any nuts, bolts or screws to make sure everything is nice and tight. A loose seat, handlebar, wheel or pedal could meet with an unhappy end.